grean tea with reishi also called in china ling zhi, the grean tea has a soft taste and can also add with honey of sugar. 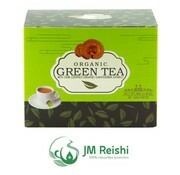 The grean ganoderma tea has a soft taste and can be drink every day as natural or with honey or sugar. The recommend value for the daily value reishi would be the best if you drink at least 2 cups a day. Please make sure that if you drink reishi products that we recommend at least 1 liter water a day.